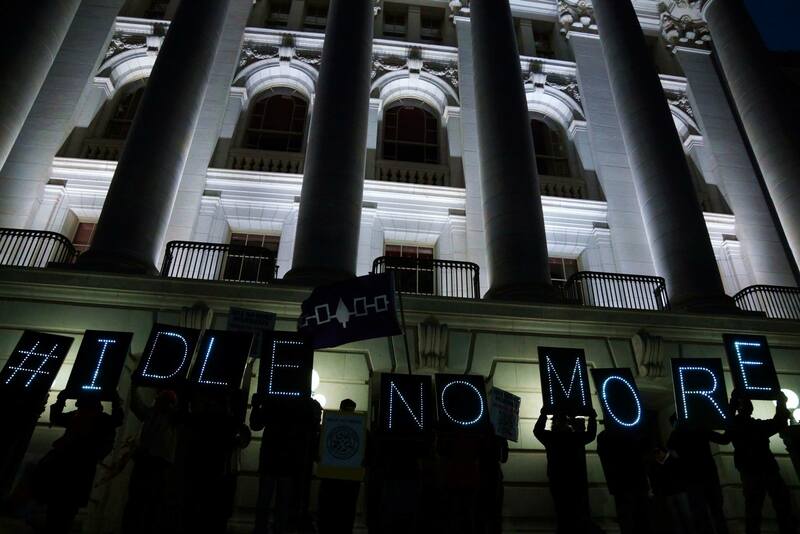 January 13, 2013 #IDLE NO MORE at WI Capitol with Overpass Light Brigade. 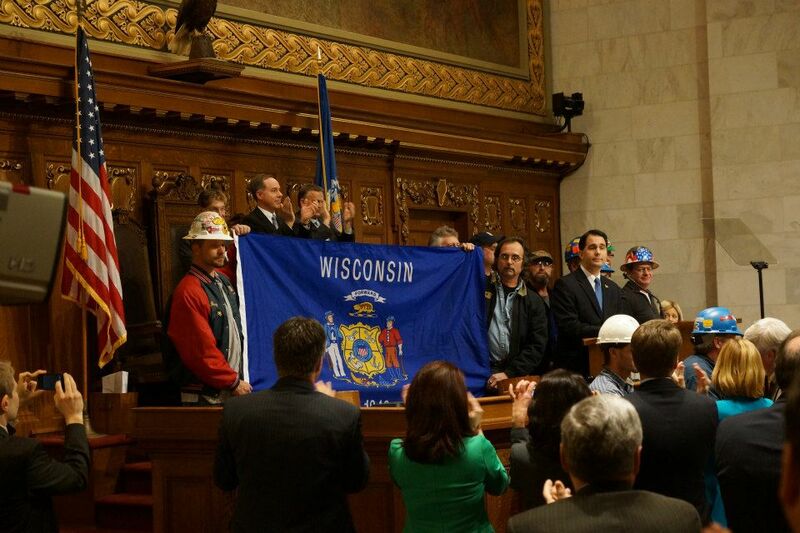 January 15, 2013 The State of the State address includes this show by Gov Walker that job creation can be achieved through iron ore mining. 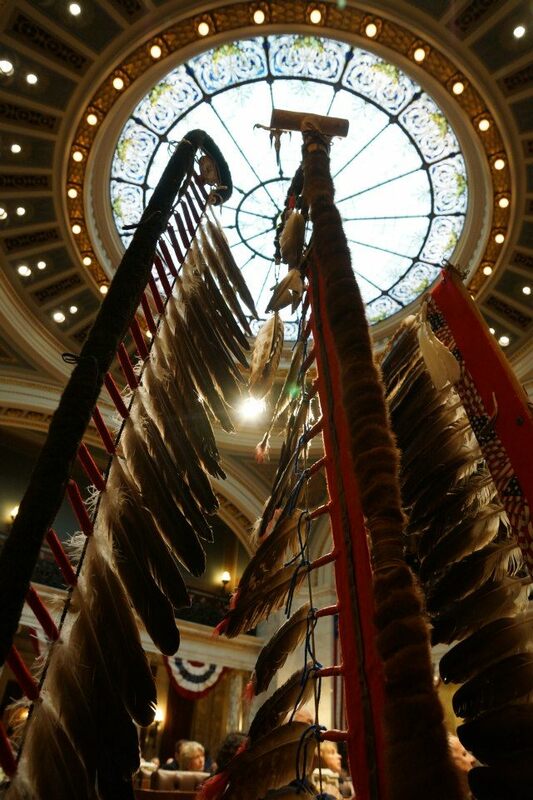 By the end of the year, the mine project is mired in legal battles and environmental concerns. 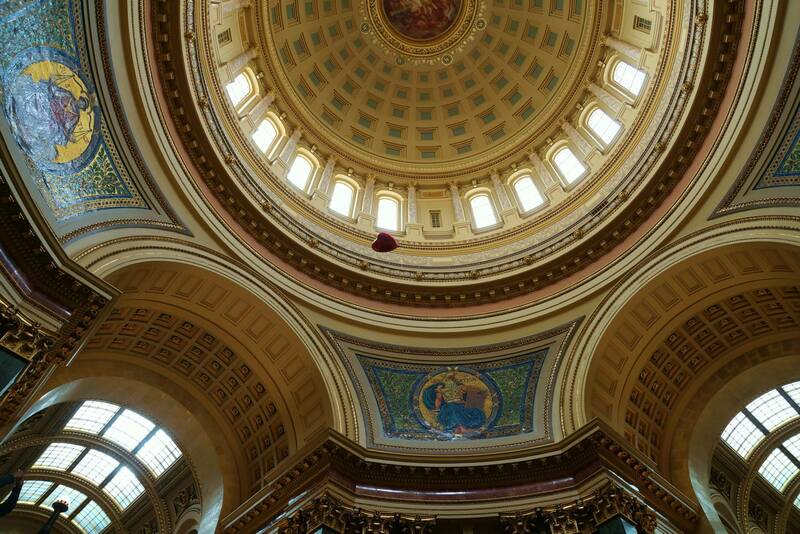 February 14, 2013 The two-year anniversary of the WI Uprising with a red heart balloon release during the Solidarity Sing Along and Solidarity Forever. 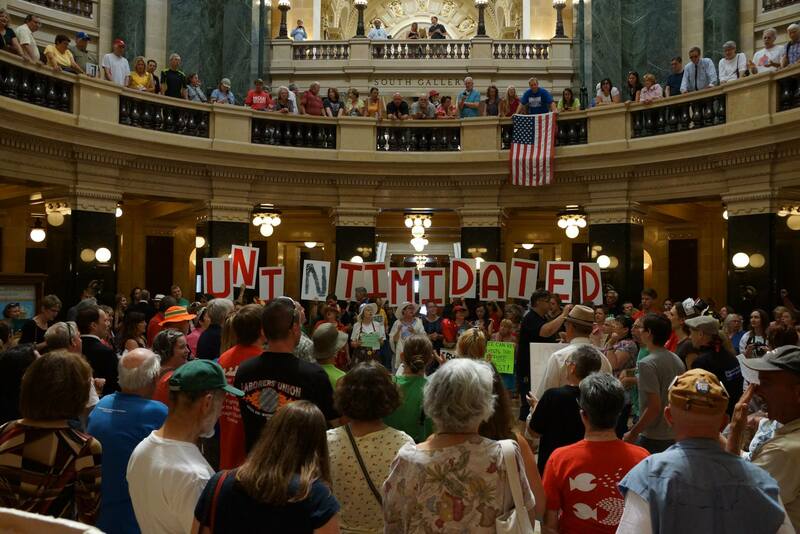 February 27, 2013 There will be no mine in Northern Wisconsin. 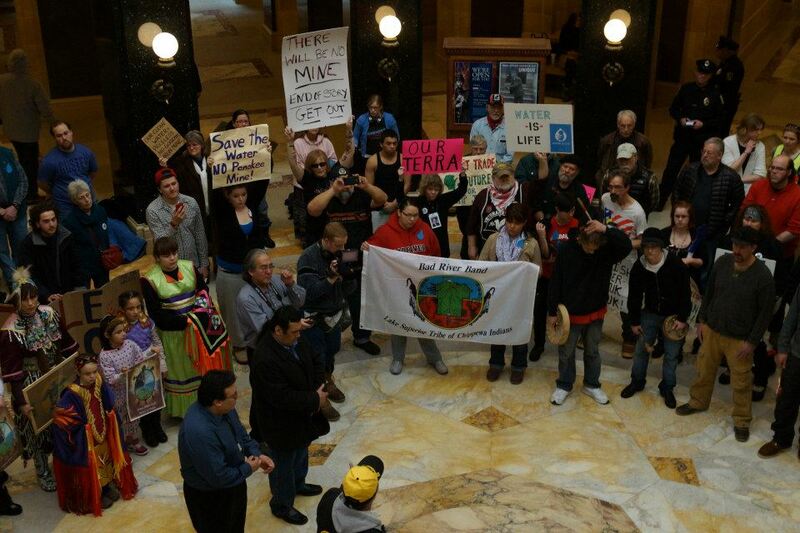 April 9, 2013 The State of the Tribes address. 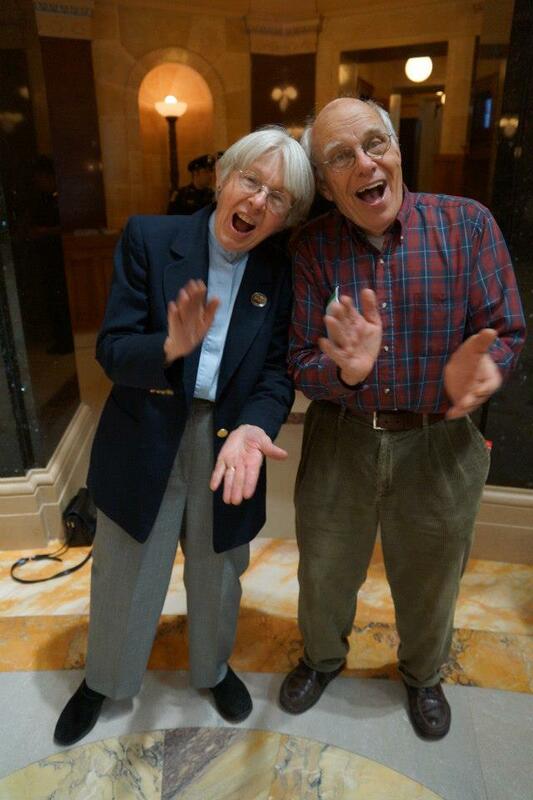 April 30, 2013 Joan and Tom Kemble sing at Solidarity Sing Along. 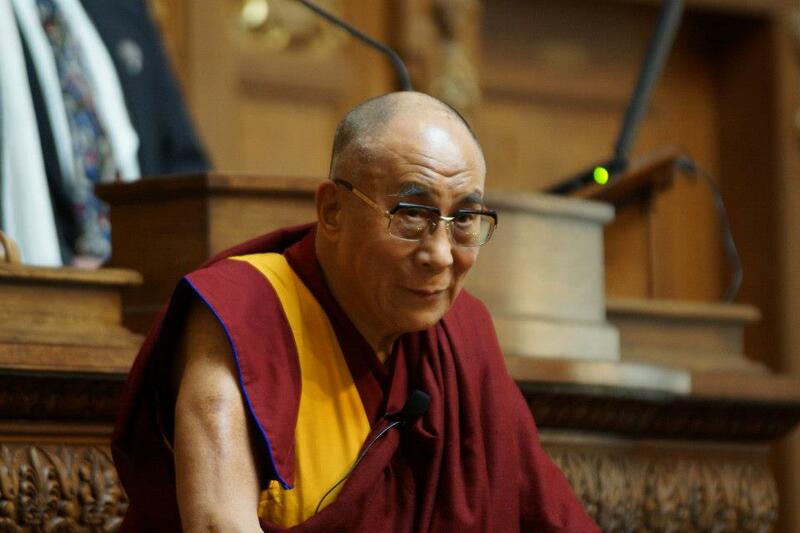 Both octogenarians would be arrested for this same activity later in the year. 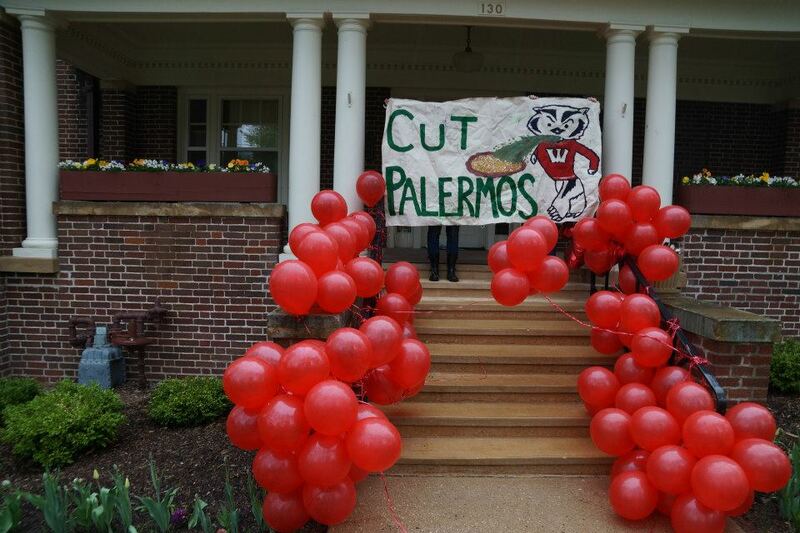 May 9, 2013 UW students walk to Chancellor David Ward’s home to protest the UW’s continuing business relationship with Palermo’ Villa, where 105 workers lost their jobs after a labor dispute. 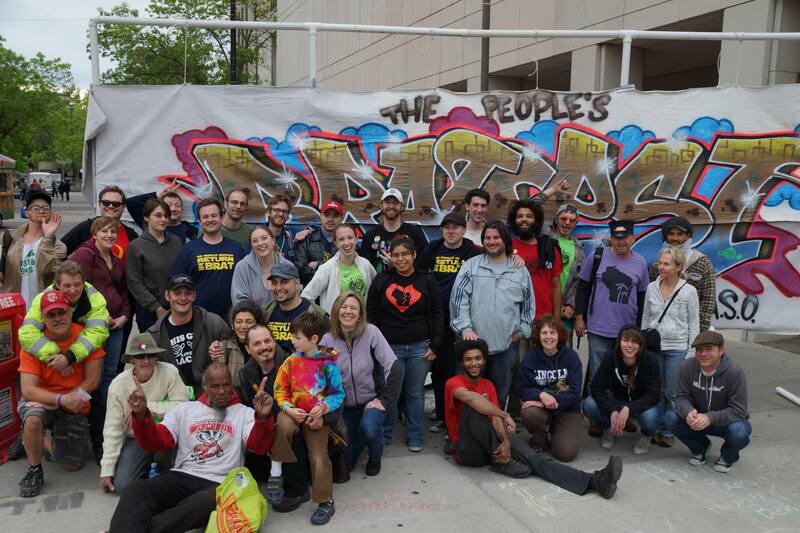 May 25, 2013 Autonomous Solidarity Organization presents The People’s Bratfest, an alternative bratwurst celebration to raise money for charities and community groups. 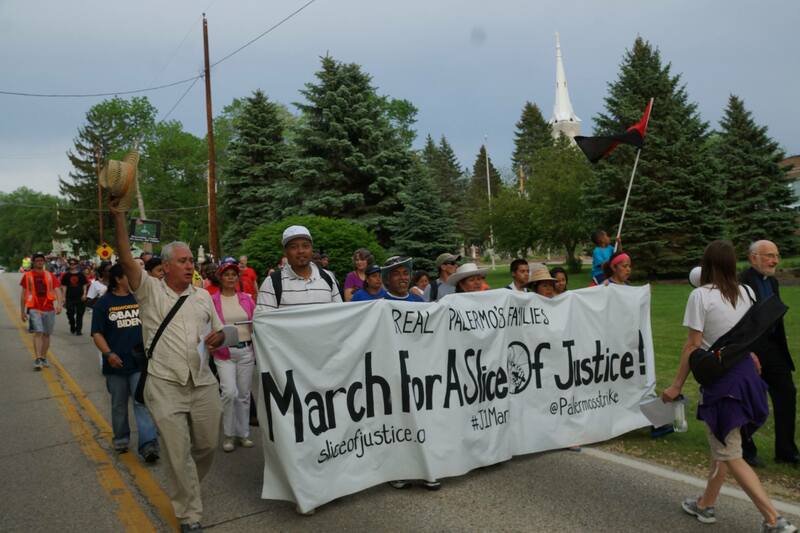 June 1, 2013 Walk for a Slice of Justice in Milwaukee where displaced Palermo’s pizza workers walked over 18 miles from the factory to the owner’s home in Mequon to ask for a meeting to negotiate an end to their labor dispute. 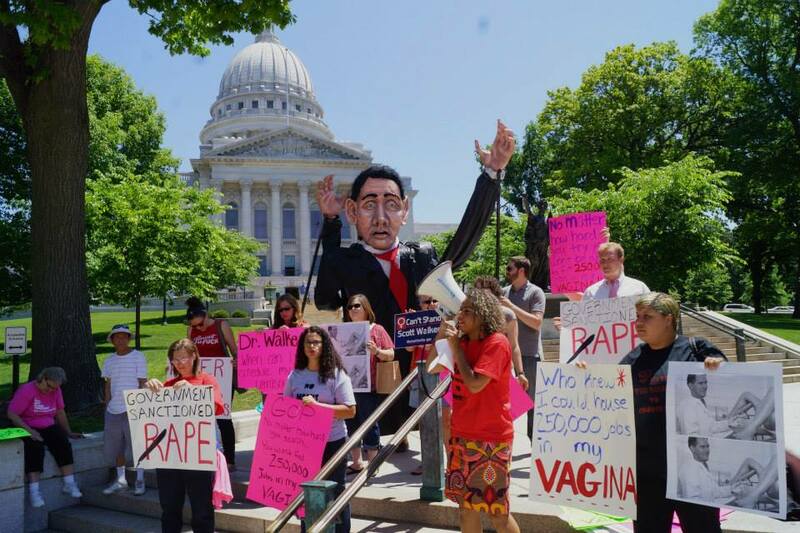 June 13, 2013 Women protest the new WI abortion requirements legislation by wearing duct tape over their mouths, until forced to remove the tape by Capitol police officers or risk arrest. 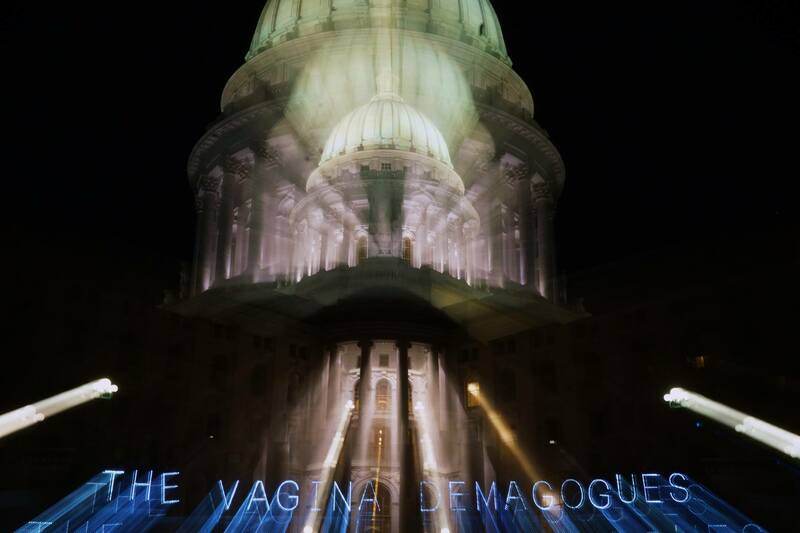 June 14, 2013 A message from Overpass Light Brigade to the Wisconsin Legislature. June 20, 2013 No Means No rally. 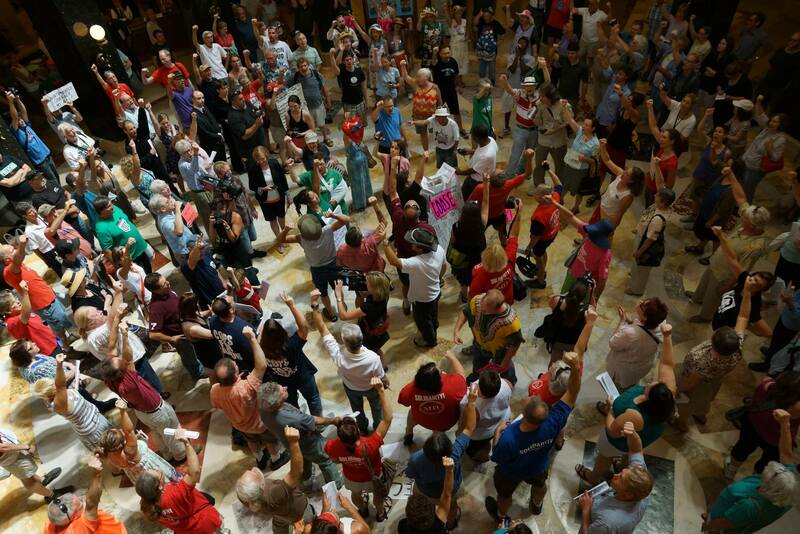 July 24, 2013 Capitol Crackdown arrests for singing begin over the noon hour with many singers refusing to stop singing. 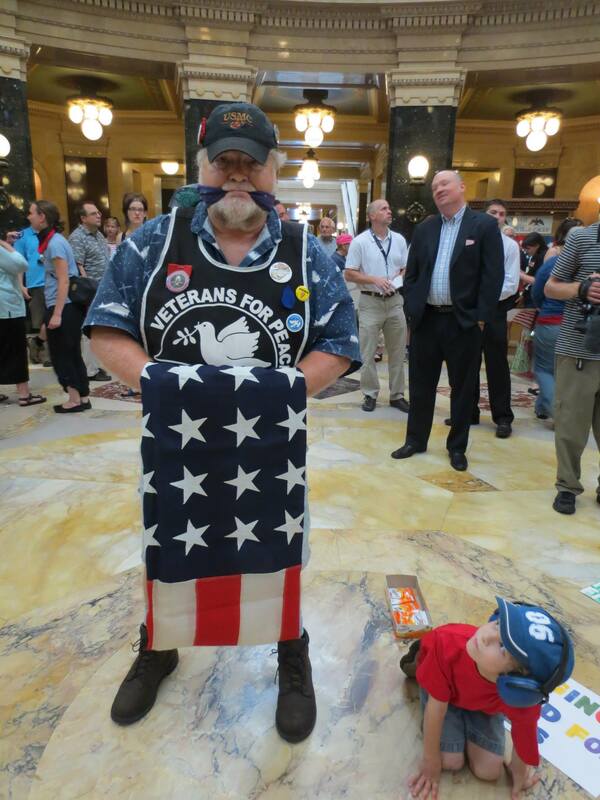 July 25, 2013 Lars and friend before the Veterans For Peace activist was arrested, his flag falling to the ground and stepped on by Capitol police officers. 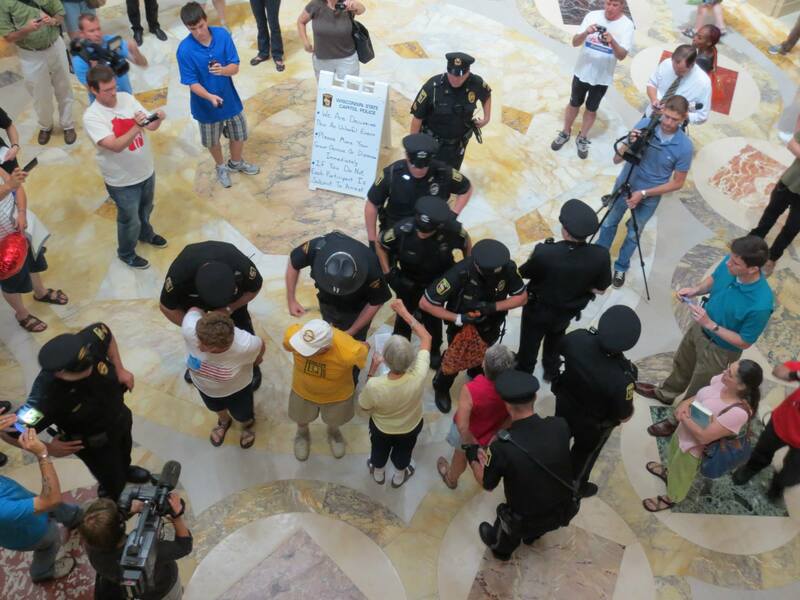 July 30, 2013 Protecting Will from yet another arrest for singing without a permit in the rotunda of the WI Capitol. 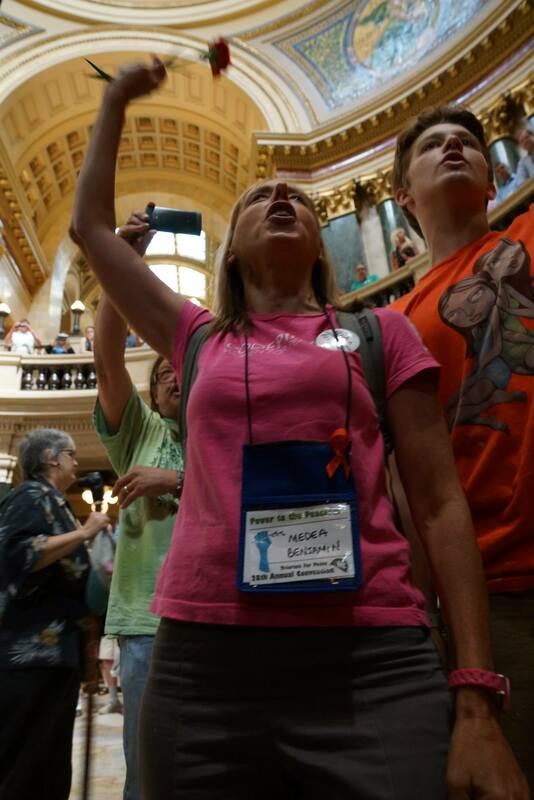 August 8, 2013 Medea Benjamin and Jack sing immediately before Jack, a minor, is arrested for singing in the WI Capitol rotunda without a permit. 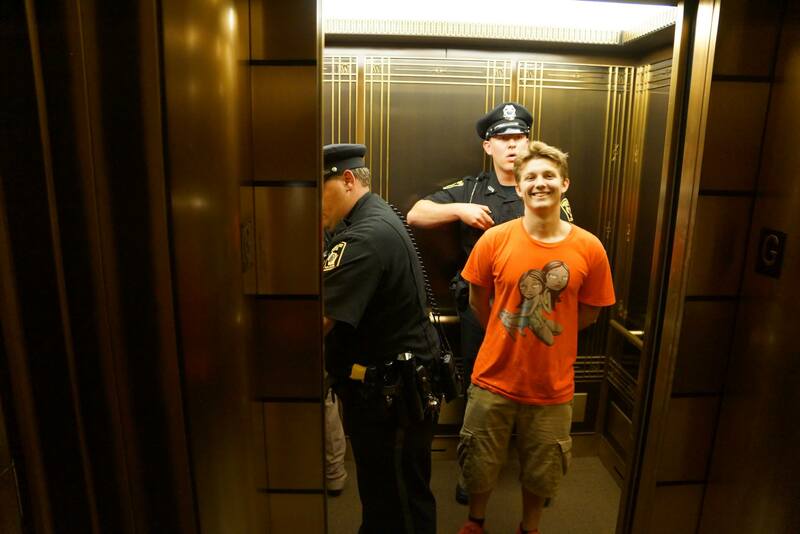 August 8, 2013 Jack in the elevator in handcuffs. 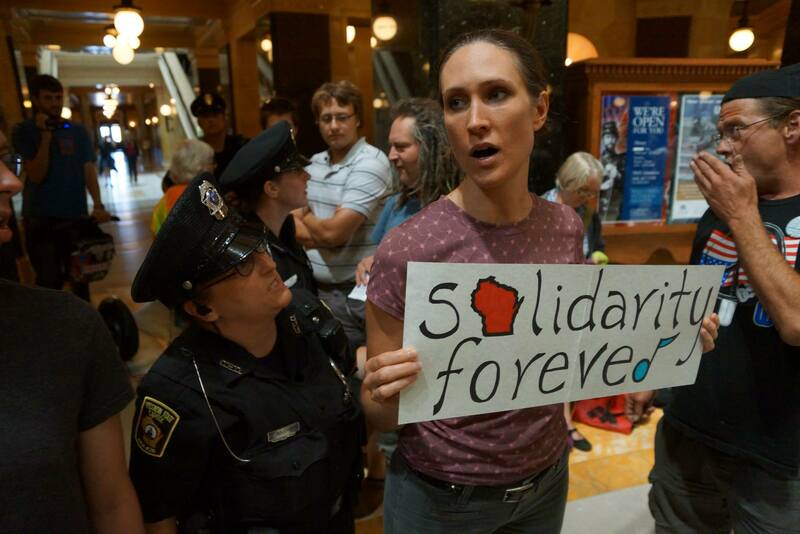 August 13, 2013 Solidarity Forever with Kaja. 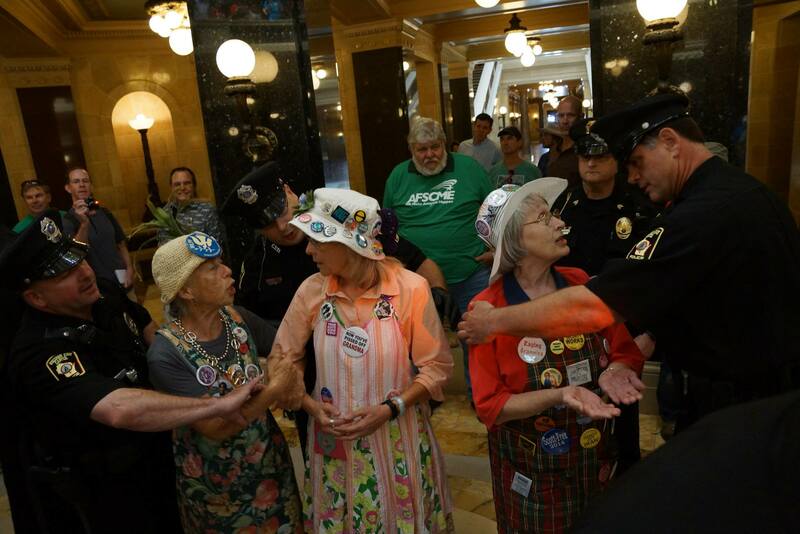 August 15, 2013 Three of the Raging Grannies of Madison arrested for singing. 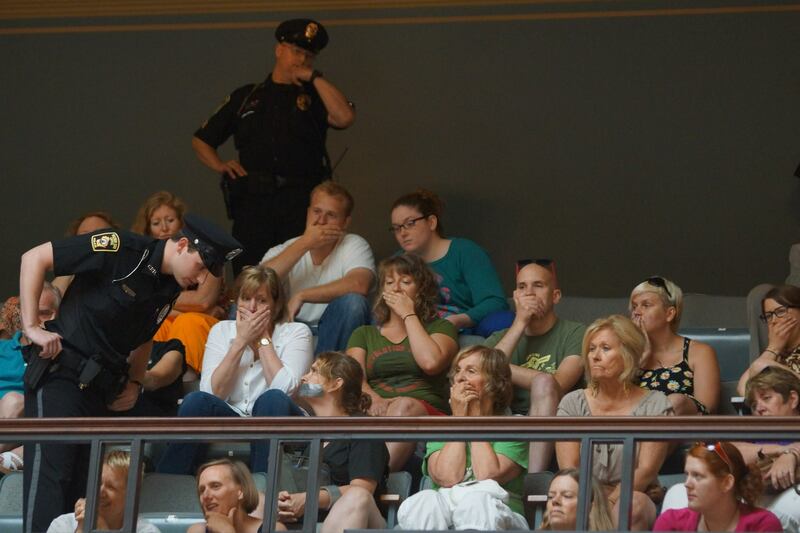 August 19, 2013 Madison firefighter Teddy Higgins immediately before his arrest for singing without a permit. 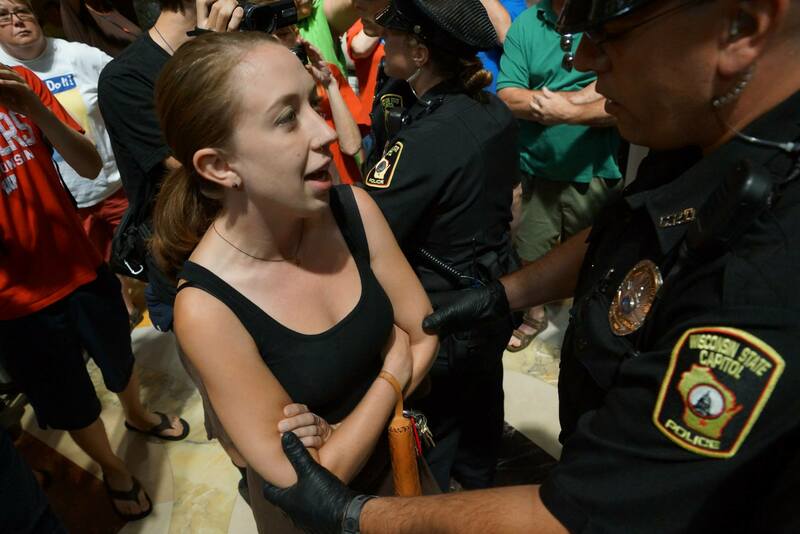 August 21, 2013 Emily stands her ground with CPO James Brooks and asks to receive her civil forfeiture citation for singing in the rotunda. She is promptly subdued using pain compliance, arrested and taken to jail. August 26, 2013 CJ Terrell is subdued using pain compliance techniques. 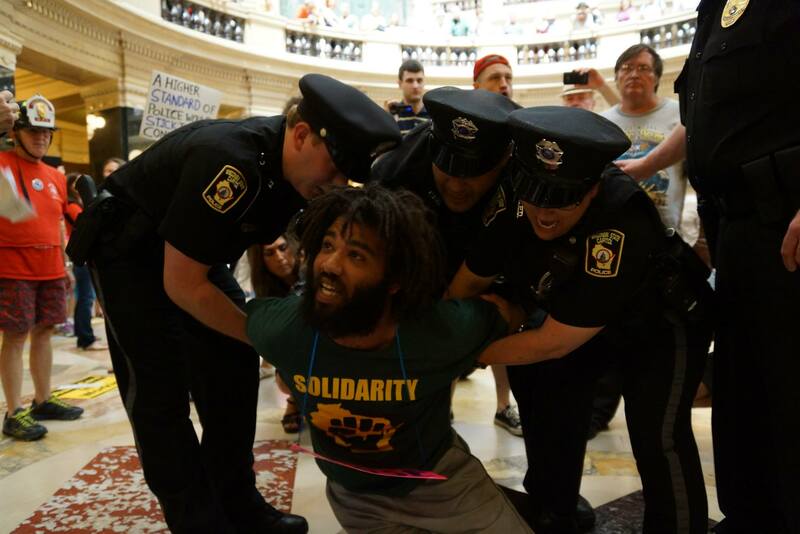 He was arrested for singing at the WI Capitol without a permit. 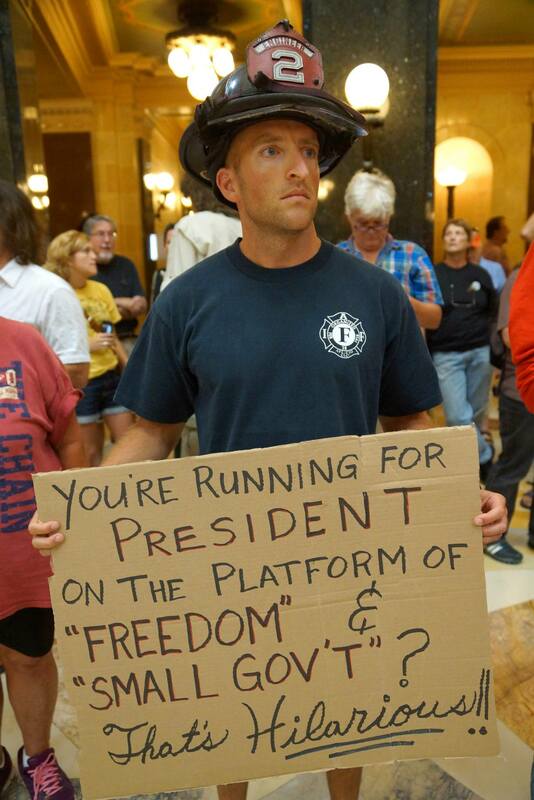 August 27, 2013 The Cops Are Behind You! 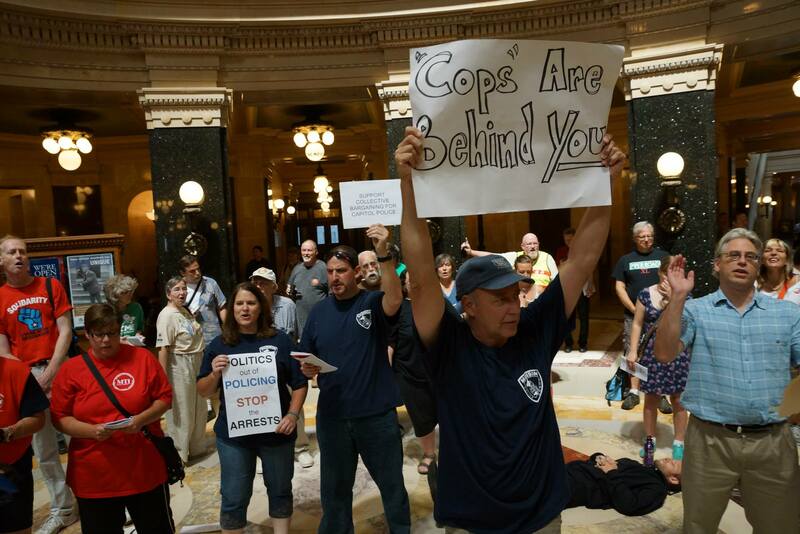 Madison Cops For Labor sing in the rotunda. 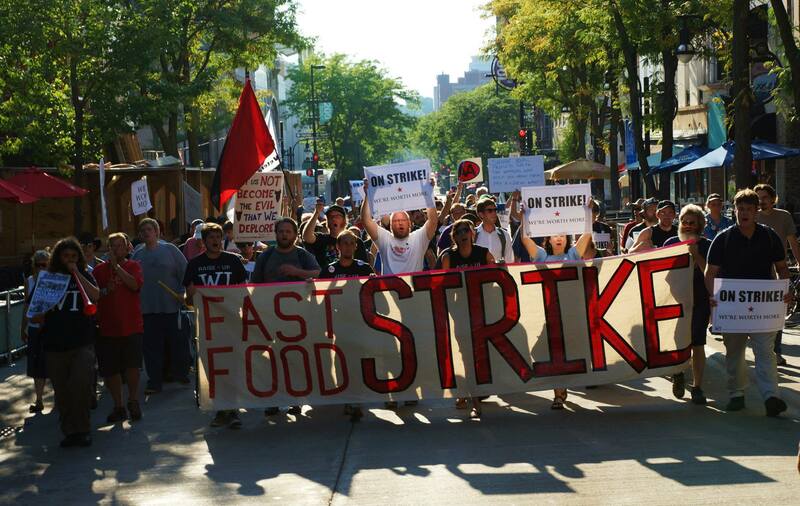 August 29, 2013 #829Strike We’re Worth More. 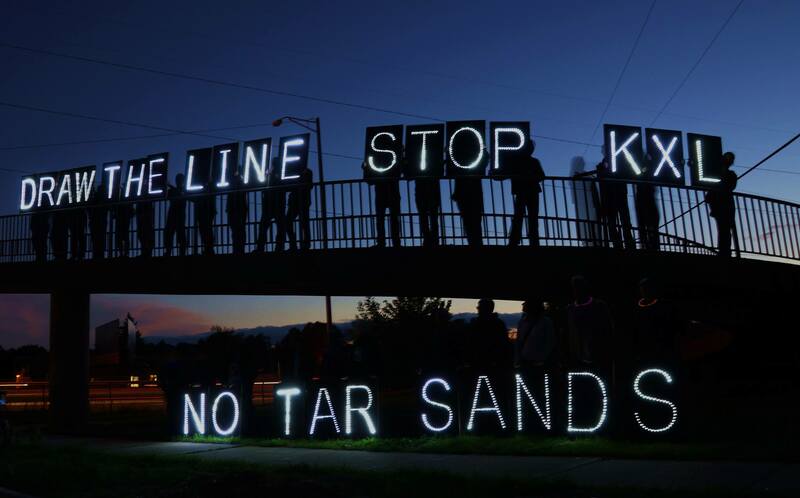 September 20, 2013 Draw the Line-Stop KXL with Overpass Light Brigade. 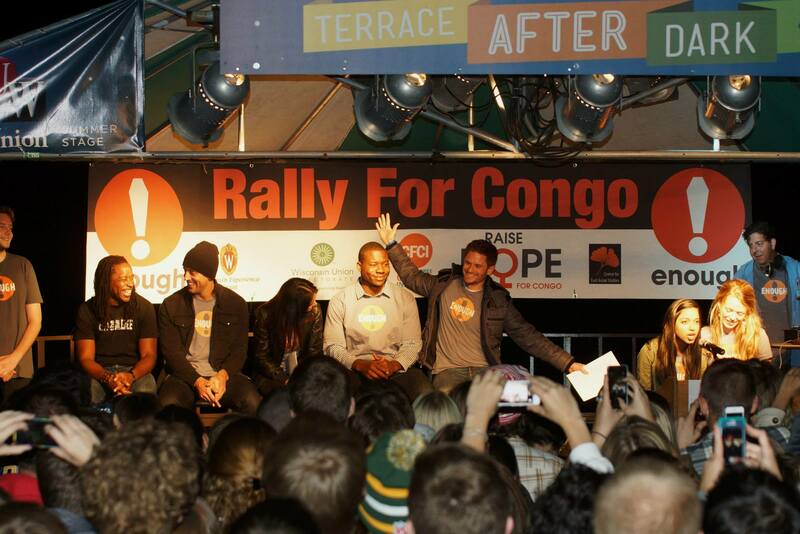 October 7, 2013 Rally for a Conflict-Free Congo with event organizer JD Stier and GB Packers quarterback Aaron Rodgers, making a well-received political statement about the violent, unsafe living conditions in the Congo. 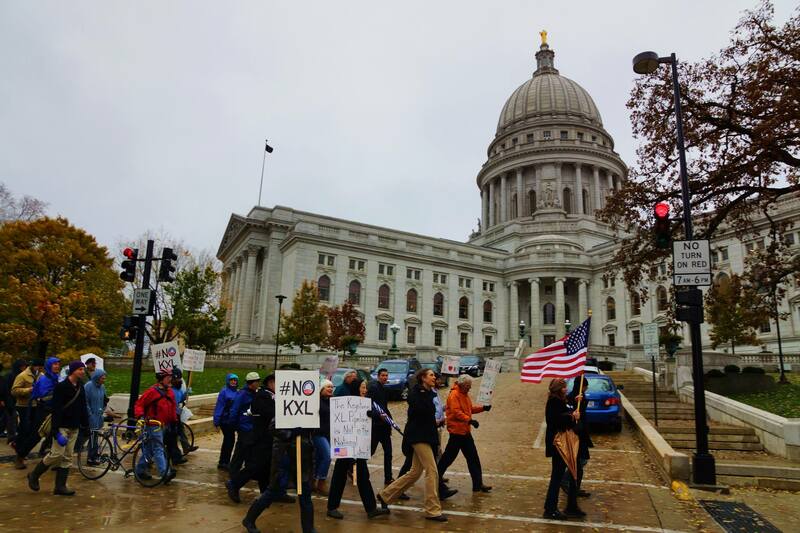 November 6, 2013 An Open letter to President Obama-Stop the Keystone XL pipeline or there will be civil disobedience. 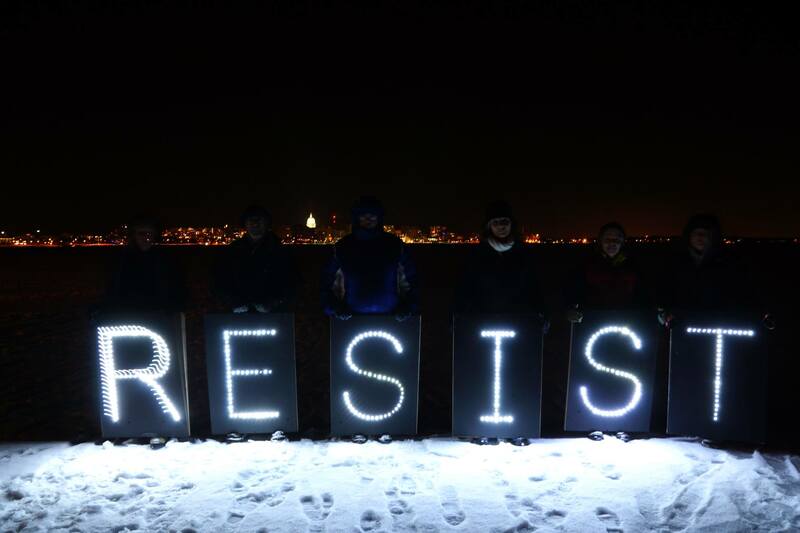 December 28, 2013 RESIST with Overpass Light Brigade on Lake Mendota. To view the original hi-resolution images, go to Flickr: http://www.flickr.com/photos/99603156@N03/sets/72157639232189336/ Thank you! 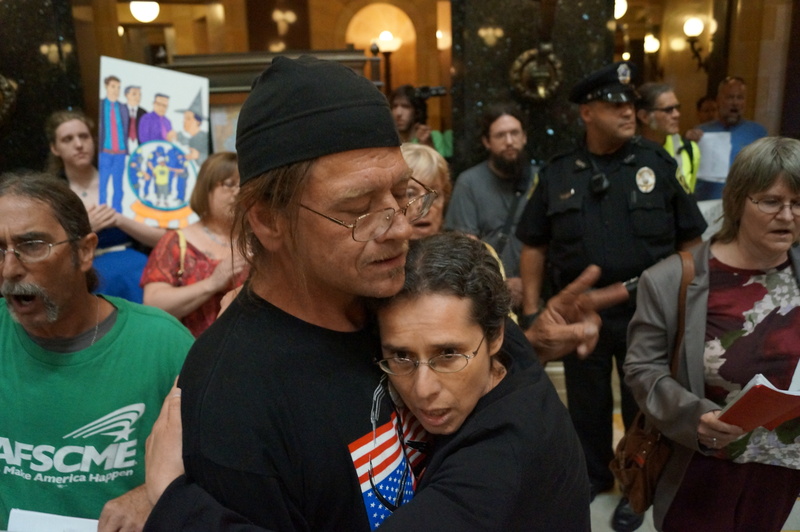 Great retrospective on the Walker vs. Wisconsin reign or (t)error. Thanks, WCMCoop, you are the best.